Posted on September 27, 2014	by Katy K.
I’m tagging in at the very end of the More Diverse Universe that Aarti over at Booklust is hosting. Looking closely at the rules, I realized that none of the books with diverse characters that I already have waiting to be reviewed counted for this, as they weren’t written by diverse authors (at least, not that I could tell!) I was very glad for the reminder to read this book, and put my name on the list for William Alexander’s Ambassador, a middle grade science fiction book that fits in with this theme as well. This is a book where the back story hooked me. Way back in the 1940s, the Golden Age of comics, a small comics company hired a Chinese-American artist to draw their new comic, The Green Turtle. Legend has it that the artist asked to have the Green Turtle be Chinese-American as well, but was denied. Sticking to the letter of their request, the artist never showed Green Turtle’s face at all, leaving his ethnicity open to the imagination. In The Shadow Hero, Yang and Liew start the story over again, this time explicitly creating an origin story for the first Asian-American superhero, including explanations for many of the unexplained strange things in the original comic. Hank is the 19-year-old son of Chinese immigrants who run a small store in Chinatown. When his mother is saved from a thief by another superhero, she decides that being a shopkeeper is no longer good enough for her son: he must be a superhero. Every time she hears of a new superhero’s origin, whether it’s coming in contact with a toxic spill or visiting a spiritual medium, she drags Hank over to try it, all the while making him take fighting lessons from an old beau of her own. Hank doesn’t acquire any superpowers, but he does get skin that turns hot pink whenever he gets wet, thus explaining the lurid skin color the Green Turtle has in the original comics. When Hank’s half-hearted attempts at playing superhero wind up getting his father killed, his mother gives up on the idea, while Hank decides to use his superhero persona to bring down the criminal ring that caused his father’s death. Fortunately, he now has some superpowers, courtesy of the Turtle Guardian who came from China with his father. Liew’s art does a good job of telling the story and keeping all the characters straight with a style that ranges from comic-book realistic to touching on Asian stereotypes. It’s colored in a limited palette that recalls both the time period and the old four-color comic books. 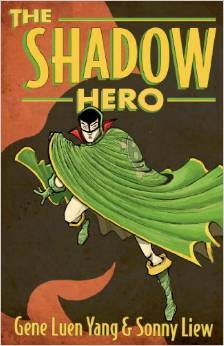 The Shadow Hero is a solid superhero origin story, complete with adventure, failure, humor, and a touch of romance. The highs and lows of Chinese culture in the 1940s are also on display, along with the less-than-understanding reception of Chinese by other Americans. This is an impressive and highly enjoyable book – hopefully just a start to a series! Highly recommended, especially to superhero fans teen and up. This entry was posted in Books and tagged #diversiverse, Asian-American, diversity, graphic novels, superheroes, teen graphic novels. Bookmark the permalink. Hi there, I really like this post on “A More Diverse Universe.” My upcoming book doesn’t feature a racially diverse cast of characters but I myself am of Chinese ethnicity living in Singapore. So is my husband who is the illustrator for the book. On that basis, would you be keen to review it when it’s published around December? Thanks for commenting, Rachel! I’m going to be busy with my reading for the Cybils award up through the end of the year, but you’d be welcome to submit a description of your book through my contact form – maybe I’d be able to consider it for review next year. Thank you! I really enjoyed it! I did read one reviewer who felt there wasn’t enough story, but I think it was someone who wasn’t familiar with graphic novels & the amount of story that typically fits in.